How’s it going? How’s your February treating you? I have to say it does feel very pleasant to have fallen into some kind of normalcy around here. My house actually feels clean for more than two days and my liver is well and rested. This month I am scrambling around trying to get some projects around the apartment finished. We have two friends coming into town to stay with us in March and it has given me such a good mental deadline to get everything squared away around here. Do you guys ever feel so overwhelmed by all the home ideas on pinterest!? I feel like it made me feel more indecisive about decorative decisions than when I started. Once I finally stuck with my gut I felt incredibly productive by the progress! I’ve painted walls that I wanted to paint since the day we moved in… six months ago… and I have put up nicks and knacks that have been stuck in boxes. I even hung wallpaper up for the first time in the guest room (it was the easy kind 😉 But still! It made me feel amazingly accomplished. This little place is finally starting to feel like our home and I can’t wait to show you all the details! Aside from getting my apartment all groomed and hair-sprayed, I have also turned up the healthy game in our fridge. I’m on the kombucha tea and salad grind for lunch. Jared and I have even challenged each other to 100 sit ups every day. Today was day one, ha! But we kept our word. We sat down on the living room and did all of em. I’m hoping we can keep it up! When it comes to light and fresh meals, salads are my go to healthy food. I actually really do love a good salad. I know some people are really turned off by them but I think they can become such a lovely meal with a few added ‘oomphs’. 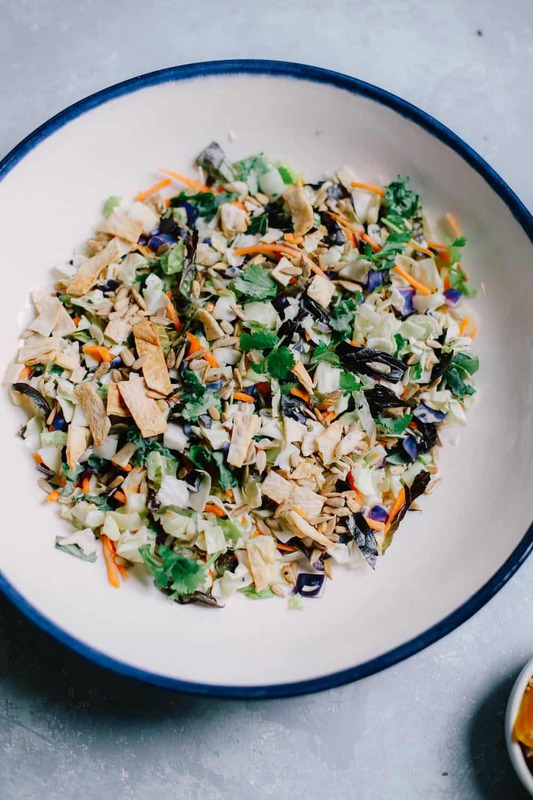 For the salad featured today, I have partnered up with Earthbound Farm and TheFeedFeed to show you all that a salad can be a complete, whole and an absolutely delicious meal. 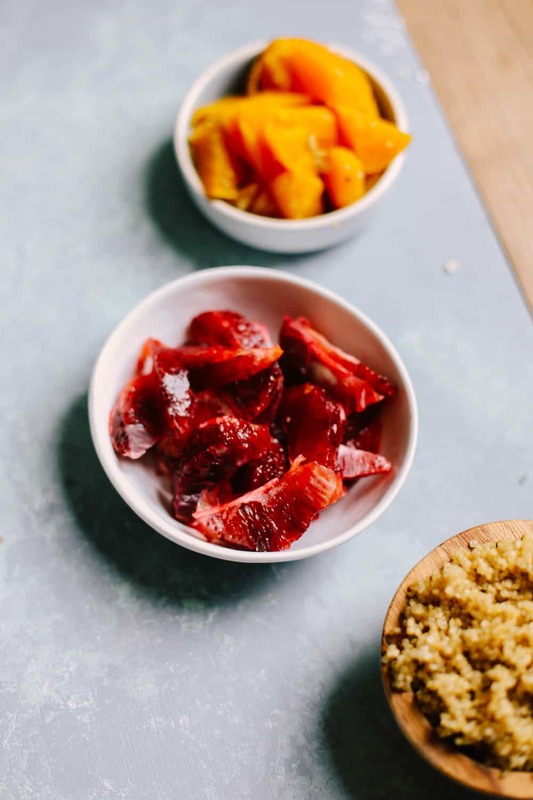 If there is one thing that I will always want you to experience from my blog recipes it is delicious and fresh flavor, especially if it’s ‘healthy’! I love to start out with a solid base and a big shallow bowl. For today we are using the Earthbound Farm “Organic Asian Chopped Salad Kit” to start and filling it out with some great toppings. 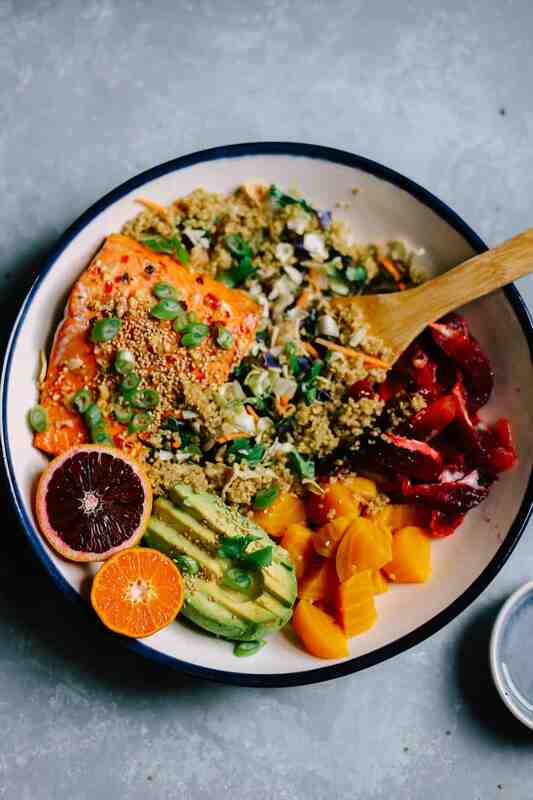 When I’m making a strong salad like this one, I usually try to add a grain / legume, protein and some fresh fruits or vegetables. 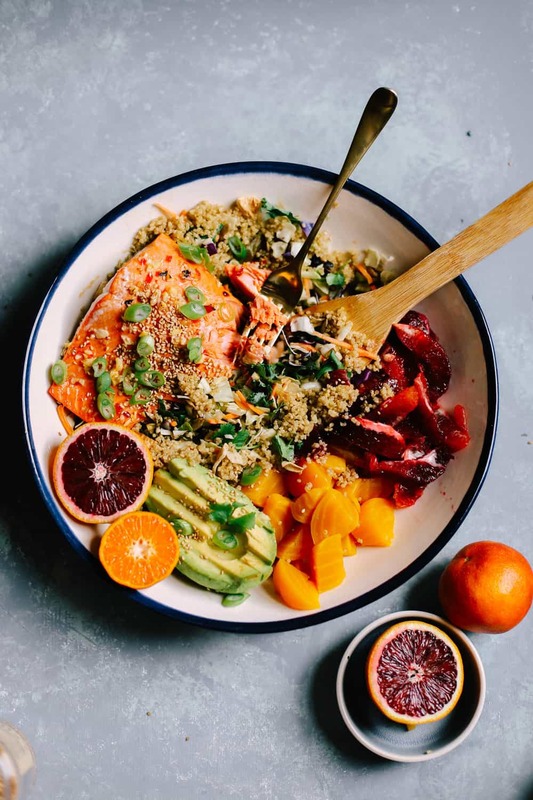 Since we are using an asian blend base I went with a red chili glazed salmon, blood oranges, and quinoa to keep it fresh and flavorful. Whisk together red chili sauce, olive oil, lemon juice, ginger, and garlic. Pour over cold salmon filets on a baking sheet. Bring salmon to room temp while sauce is marinating on top of filets. Bake salmon for 12-15 minutes or until temperature has reached 145 degrees internally. 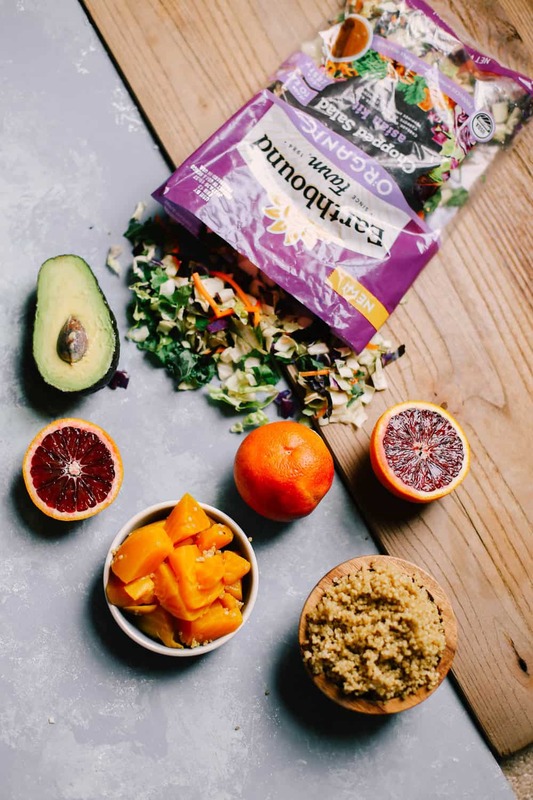 In a large shallow bold combine salad kit, beets, quinoa, blood orange segments, avocado slices and gently toss. Top with cooked salmon filets and garnish with sesame seeds and chopped green onions. **Note, if you’re in a pinch for time you can always grab the toppings from whole foods or your local grocery store, pre cut.